Looking for movie tickets? Enter your location to see which movie theaters are playing Bad Moms (2016) near you. 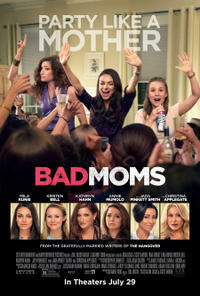 Parents, how much will YOU enjoy ‘Bad Moms’? Diane Mizota breaks it down in this week’s Mom’s Movie Minute – Mom’s Night Out Edition! Over-the-top comedy is funny but raunchy, predictable.